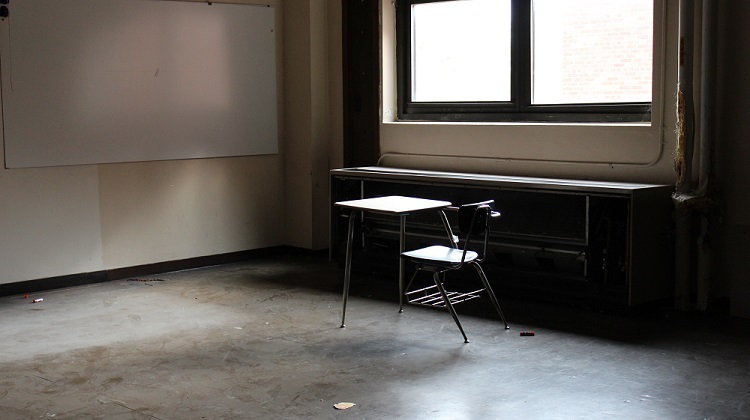 A vacant Highland Park classroom. Photo by Audrey Spalding. The financial challenges faced in the Buena Vista and Pontiac school districts have been a hot topic for many weeks now, with several commenters trying to use these districts’ issues to make a case for giving schools more money. But school districts do not simply find themselves one day without any cash on hand. It takes years of financial (not to mention academic) mismanagement to get to the point where the Buena Vista and Pontiac school districts have placed themselves. While public outcry and political grandstanding has resulted in the Buena Vista school district being reopened for the remainder of the school year, one has to wonder whether students will see much academic benefit. After all, this is the district where MLive recently reported that no student scored proficient on eight different MEAP tests. That was up from the previous year, when the district had five MEAP tests where no student scored proficient. There are only 18 different MEAP tests. Michigan Capitol Confidential recently reported that Buena Vista approved a three-year teachers union contract in 2011 that awarded raises and paid for 100 percent of health care costs — even though enrollment had dropped by 13 percent in a matter of months. Pontiac is not doing much better. Average teacher salaries have soared in recent years, as enrollment has tumbled. This appears to be a product of the district using seniority to make layoff decisions, instead of considering teacher cost and quality. From afar, district financial difficulties appear contained. However, financial problems are generally a symptom of a dysfunction throughout the district. Dysfunction is the only way the Pontiac school district could have spent $16,400 per student but not provide toilet paper to students. Dysfunction is the only way that Buena Vista officials could have taken state money for a program that doesn’t exist and assume that there would be no repercussions. I have been visiting Highland Park schools during the past year to watch the former conventional district transition to a charter district. The district was also dysfunctional: Highland Park was spending nearly $20,000 per student. And somehow, the bathrooms were filthy. Somehow, holes in the ceiling were never repaired. Somehow, students at the high school saw rodents in their classrooms. At one Highland Park school, about a third of former Highland Park district teachers stayed on when the charter management company took over. Students say that the school has changed for the better — and that their teachers actually teach this year. How is it possible for a school to change so dramatically with so many of the same teachers as the year before while spending less money? By changing a culture of mismanagement and waste. District financial mismanagement means that vast amounts of taxpayer dollars are being wasted. It is especially deplorable that some public school districts with large disadvantaged student populations are spending so much while doing so little for their students. Excuses should be viewed with skepticism: There are hundreds of Michigan districts that are not in a spending crisis. They have survived or thrived while facing the same policy changes others blame for Buena Vista’s and Pontiac’s struggles. A question I have asked many long-time Highland Park teachers is whether the dramatic conversion of the conventional district to a charter district was worth it, to change the culture of Highland Park schools. Teachers — including unabashed critics of the charter school model — have said yes. Even in private conversations with no charter school officials present. Sometimes, dramatic change is needed. The worst thing to do for the students in Michigan’s worst schools is to let those schools limp on. The problem is more severe than simply a lack of funds.